What Is a Developmental Therapist? In early intervention, you may have several therapists or specialists working with your child and family. One of those team members may be a developmental therapist. This team member is uniquely qualified to consider the whole child and the impact of a child’s development on the family. being a sounding board for a family’s concerns. A developmental therapist works closely with families and additional members of a child’s team, including the service coordinator, to ensure that the services provided are appropriate to a family’s needs and desires. The developmental therapist participates in the assessment process, assists in the development of the individualized family service plan (IFSP), and communicates services and strategies to all team members. The developmental therapist also works with families to support the parent/child relationship, to help families find new ways to support their child’s development, and to help the family understand their rights and responsibilities as the child transitions out of early intervention. In addition, the developmental therapist can support the family in learning to observe and interpret their child’s behavior and help to identify resources that might be helpful to families. The developmental therapist works with a child and family in the home or another place that the child visits often (e.g., child care center). At each visit, the developmental therapist will review the child’s progress with the family or provider, discuss any new concerns or updates, and then model play interactions with the child. Upon completion of the visit, the developmental therapist reviews the day’s activities and plans for the next session. A developmental therapist is an important member of the EI team. By looking at a child’s overall development, the developmental therapist can enable a family to support their child in all areas of development. 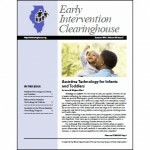 What Is Bagless Early Intervention? Early intervention providers, including developmental therapists, speech therapists, physical therapists, and occupational therapists, use bagless intervention to help improve a parent’s competence and confidence in supporting their children’s development in natural environments. Typically, early intervention service providers have brought bags of toys with them into the family home to address a child’s skills and goals. However, this approach may not always be appropriate. Instead, when service providers use toys or everyday items already available in a family’s home, parents may participate more in early intervention and engage in similar activities with the child even when the service provider is not present. Bagless intervention encourages providers to focus on routines, activities, and materials that are familiar to the child when addressing IFSP outcomes. This allows the caregiver to observe and participate in an activity that happens naturally within the child’s context. For example, a provider might focus on fine motor skills during a mealtime interaction. A toddler can peel a clementine or pick grapes off the vine. The provider can also observe the utensils that the family uses and determine what modifications are necessary, if any. A narrow handle on a spoon can be adapted by securing a sponge hair roller or a small stress ball around the handle. Bagless intervention is flexible, individualized, and adaptable. The parent-child interaction continues long after the provider has left the home because the toys/supplies used during the visit are still with the child! ← Set Me Up for Success!